Darrell A. 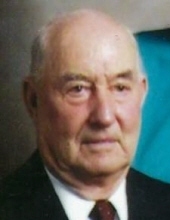 Chambers, 104, of Lostant, passed away Wednesday, April 3, 2019 at Manor Court in Peru. Funeral services will be 11:00 AM Monday, April 8, 2019 at the Mueller Funeral Home, Lostant with Pastor Brett Todd of Grace United Methodist Church, LaSalle officiating. Burial will follow in Hope Town Cemetery, Lostant. Visitation will be 9-11:00 AM Monday at the funeral home. Mr. Chambers was born October 11, 1914 in Lostant to George and Mamie (Durbin) Chambers. He married Lois J. Schroeder on June 25, 1944 at the Richland Evangelical Church. Mr. Chambers was a veteran of the U.S. Army National Guard. He was a member of the Magnolia Methodist Church. He was also a member of the Masonic Lodge #870 AF & AM, the Masonic Shrine in Peoria and the Scottish Rites in Peoria. He was a past master of the Lostant Masonic Lodge. He was a lifelong farmer. Survivors include his daughter, Cynthia Sobin of Spring Valley; three sons, Dennis (Beth) Chambers of Henry, Kenneth (Mary) Chambers of Magnolia and Gary (Linda) Chambers of rural Lostant; 12 grandchildren; 21 great-grandchildren and several nieces and nephews. He was preceded in death by his parents; his wife, Lois on January 18, 2009; one daughter-in-law, Judy Chambers; one son-in-law, Pat Sobin; two sisters, Margaret Genvosse and Phyllis Easton and two brothers, George and Lyle Chambers. To send flowers or a remembrance gift to the family of Darrell A. Chambers, please visit our Tribute Store. "Email Address" would like to share the life celebration of Darrell A. Chambers. Click on the "link" to go to share a favorite memory or leave a condolence message for the family.